Saw an interesting product on another site.. Gator Guard, looks like a pretty good product to protect, and/or repair, those ugly keel scrapings any good paddler gets sooner, later, or always when fishing in the environments we all like so well. When cleaning up the canoe recently I notice the impact areas of the bow/stern keel ares are looking a bit beat and worn and may need a little attention and protection. 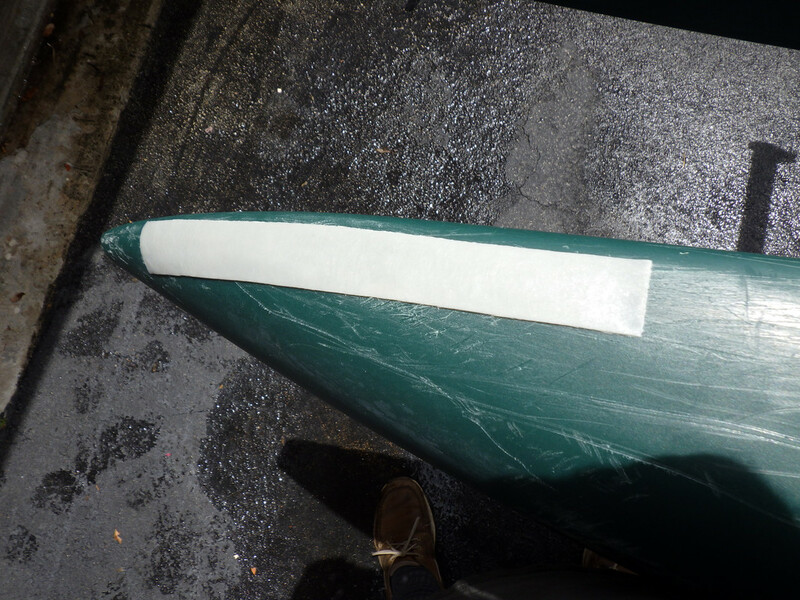 For the canoe its easy to just rough it up and use a cople strips of fiberglass, but for any roto-mold craft that just would not do well. Gator Guard KeelShield ... Gator Guard KeelShields for Kayaks, anyone tried this stuff or others. I like it, will definitely use to protect my SOT from that abrasive boat ramp I slide it on. One of my canoes is Royalex and it cuts pretty bad when contacted by barnacles or the like. I've heard it was hard (almost impossible) to repair since nothing wants to stick to it. Recently I was told that the new UV cure epoxies that are becoming popular for fly tying do a great job for filling the cuts and scratches. You fill the voids then use a razor blade to remove the excess. A strong sunny day does the rest. This Gator Guard stuff looks like it may be a similar product with fiberglass cloth added. If it will stay stuck to a rotomolded PE kayak it probably will work on Royalex too! This is what I have been using for years, on royalex, gelcoat or plastic boats. 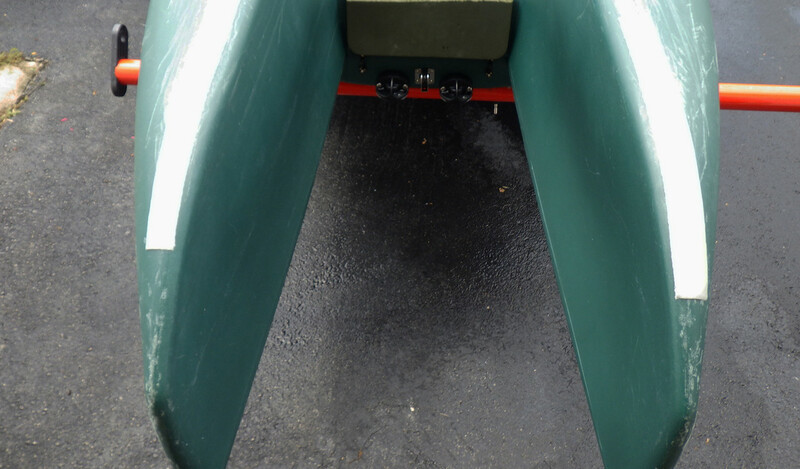 It works to protect bow and stern. Can be removed with a flat metal spatula. It is moldeable and easy to apply. Looks like crap unless you sand and paint but I let the scraping I do to hull sand it down. It wears well but needs to be tended to when you knock off a section. Just add some more over top of existing, I clean it with alcohol before applying. But that gator guard is worth a try see how long that lasts. Surfers been using sun cure epoxy's for years, a seasoned surfer never leaves home without it. For may years products similar to the JB Weld putty stuff, usually 2 part stick you knead together, has been a must have in any old boaters emergency fix-it quick and dirty bag. That Gator Guard looks good so long as you don't have to much of a bend/curve, and the UV cure is a bonus. I'm going to give it a try on the W.
Seems to be a bit confusing naming of the products... but the product you want for the roto-molded kayaks is called Gator Patch, the company is Gator Guard. They also have keel guard products made for fiberglass and aluminum so's of you do try the stuff make sure you get the "Gator Patch" UV Cure Reinforced Fiberglass Repair Patch. Here is yet another video of an installation on a kayak, this guy even paints it although I'd think the paint would not last long. Good video. I'll try this in the coming week. Well I gave this product a shot today. I did the install but I probably should have waited for more sun. The strips did seem to cure very well when I had direct sunlight on them. I haven't sanded or painted them yet and have not had the boat in the water. But I will say that Gator Guard is extremely easy to work with and appears to be high quality. We'll see how they hold up on a real man's kayak. I'll let you know. Oh yeah... I cut the strips with a scissor and they look big in the pictures but are actually only an inch wide. Easy peesy. Looks good, but for sure UV cure does require SunLight or alternate (black light) UV source. How easy did it cut, stuff like that sometimes gunks up scissor's. Not sure I'd bother with paint, the paint will just easily scrape off. I got plenty of sun on the strips between rain showers. It cuts pretty easy with a scissor. It's about like cutting thick slices of provolone, maybe a little tougher. Also it's not too messy. The adhesive doesn't get all over the place. Just some slight bleed on the sides of the sheet. How easily does it bend, form, and does it have a tendency to stretch if pulled like taffy ? It bends and forms really nicely. Not much stretch at all. It is super easy to use and apply. Damn Steve, quit running up on oyster beds, Jesus!